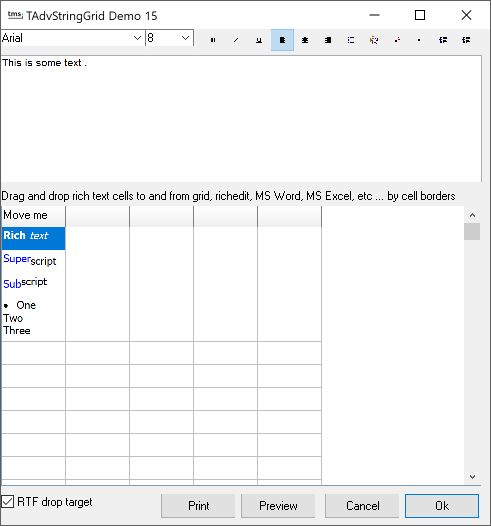 With the new rich text capabilities, you can now drag and drop rich text between cells in a TAdvStringGrid as well as all rich edit controls, MS Word, MS Excel, Outlook etc... TAdvStringGrid can now print cells with rich text content as well. For those not wanting to enable rich text drag and drop, it is as simple as setting the property TAdvStringGrid.OleDropRTF to false. This demo also shows the new enhanced column move interface. Now, arrows indicate the position where the moved column will be placed. The arrow color can be set through the public property ArrowColor. This enhanced column move is enabled when the property EnhRowColLMove is true and goColMoving is true in Options. Once again, all this functionality is available with a few lines of code. Most code goes into the initialization of the rich text cells in the formcreate event hander. Here is an example of how to specify a rich text cell programmatically. After constructing the rich text through the richedit property, the rich text is transferred to the cell with the method : richtocell(acol,arow,richedit).